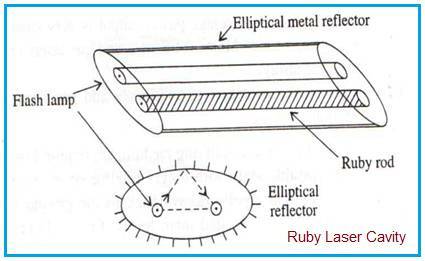 This page covers structure,basic working,advantages and disadvantages of Ruby Laser. It mentions Ruby Laser advantages or benefits and Ruby Laser disadvantages or drawbacks. • It is solid state laser type used for high power applications such as welding, cutting, drilling, molding etc. • Following criterion are required for the operation of solid state laser. By following these criterion, sufficient carriers are pumped from ground state to metastable state and then allowed for lasing action. -Two energy levels in active amplifying medium are required. Doped ionic levels act as metastable state. -Pumping or carrier inversion is necessary for stimulated emission. This is achieved by high energy flash light excitation. -Optical feedback using external mirror or crystal of electro-optic type. • The ruby laser uses ruby crystal as active or amplifying medium made from aluminium oxide doped with chromium (Cr). The chromium ions (Cr+3) take the site of Al in Al2O3 lattice, which provides metastable energy states in solid state medium. • The figure-1 depicts arrangement of typical ruby laser cavity. As shown it consits of cylindrical crystal ruby rod and cylidrical flash lamp housed along focal lines of elliptical reflector. Hence reflected light from the lamp excites crystal rod effectively. • Here population inversion is achieved by flash lamp irradiation of ruby rods. It is made of quartz tube filled with noble gas. Helical type flash lamp is employed in certain special ruby laser types for more effective carrier pumping. • Water coolant is necessary for stability of this high power laser system. • Flash light intensity depends on several factors such as capacitor size, applied voltage, tube diameter, gas pressure, gas type etc. • When ruby laser is operated in pulse mode, it is possible to obtain very high power light output. In short, pumping is done with flash lamps and laser operates in pulsed regime. ➨Beam diameter of ruby laser is comparatively less than CO2 laser type. ➨Output power of ruby laser is not as less as He-Ne laser type. ➨Ruby is in solid form and hence there is no chance of wasting material of the active medium. ➨Due to their low output power, they are known as class-I lasers. Hence they are used as toys for children. They can also be used as decoration piece and artistic display. ➨No significant stimulated emission occurs in ruby laser until at least half of the ground state electrons have been excited to the meta stable state. ➨Efficiency of this laser type is comparatively lower. ➨Optical cavity of this laser is short as compare to other laser types.